This particular category of vegetable might have been the main inspiration for doing this whole "What Is It?" project in the first place. We spent most of the summer slightly confused by folks at market being resistant to any kind of fresh squash besides straight-green-giants. We tried talking our throats dry about the virtues of multi-colored and varied shaped summer squashes, but to no avail, folks wanted the plain green ones--and we had many folks asking us why we picked our zukes so small. So, lets set the record straight, shall we? First of all, size. Summer squashes are at the very best when they're eight inches or less long and an inch or two wide (like two to three days of growth in the height of the season) or, in the case of odd-shapes, picked right when the flower falls off. When picked and eaten at this size the inside texture is consistent throughout the fruit, never pithy, and the seeds aren't developed yet and therefor don't present any texture issues. The skin is incredibly tender, and the flavor is mild, clear, alkaline, and sweet--sweet because the plant creates sugars as energy to make seeds, so if picked before the seeds develop those sugars are still present in the flesh. When cooked they create uniform, never mushy or stringy, delicious additions to soups, kebabs, sauces, and salads. And, yes, they make a fine zucchini bread. Also, this small size allows for much more color in your dishes, as every slice, or chunk, will have some amount of skin (which is where most of the nutrition is). Next the Summer Squash vs Zucchini argument. Here's the deal, not all summer squashes are zucchinis, but all zucchinis are summer squashes. Zucchini is an Italian name that refers to summer squash, incidentally, specifically "little" squash, as indicated by the "ini" ending, a diminuative. You see, squashes in general are a native plant to the Americas, and zucchini is the product of those plants being introduced into Italy after their "discovery" here. In fact there are many names for summer squash all around the world, like courgettes in France, marrow in England, and various other names in many other places. There is also one more fun catch to the zucchini conundrum--there are yellow zucchinis, black zucchinis, green stripy zucchinis, and round zucchinis. Technically, all of them are zucchini by name and Italian breeding, and all of them are summer squashes. Now, before we talk about how awesome all the different colors and shapes really are, lets just clear one last thing up, it may be a secret the green-zucchini-only-ists have been keeping from many of you--summer squashes pretty well all taste the same! Now, before you pâtisson fans out there start clamoring for a say (also, I'm clearly not talking to you, we're already on the same team) of course, there are slight variations on the general summer squash theme, but, I do think it is utterly safe to say that if you like green zucchini's flavor you will also like patty pans, crooknecks, zephyrs, eight balls, and all the other guys. If, in fact, you can detect a discernable difference in the flavor between a Bennings Green Tint and a Costa Romanesco I applaud your refined palette, but I'm willing to bet, while you might experience a preference, I sincerely doubt you'll "like" one and "not like" the other, they're just too similar. So, lets not say that all summer squashes are created equally, but lets say their differences make all of them better. The next time you go to put green zucchini in your spaghetti sauce add some other guys too! There are light yellow, dark yellow, light green striped, speckled, bicolor, tan, black, and white summer squashes. Imagine how nice it will be to see all that color in the middle of January! One more thing, the round guys. We grow a variety of zucchini called Eight Ball. It's round, and anywhere from billiard ball to grapefruit size. So many folks asked us what to do with this summer squash (or just avoided eye contact with us when they saw them, fearing, perhaps, the shame we must feel at our misshaped squashes?) here's the tip: They are excellent stuffers! Sure you can use them in the same context as usual, but! if you cut off the top and hollow them out (just like a mini pumpkin!) and saute up the innards with onion, garlic, red peppers and mix that with some rice cooked in chicken stock, (maybe some spicy sausage added in too?) 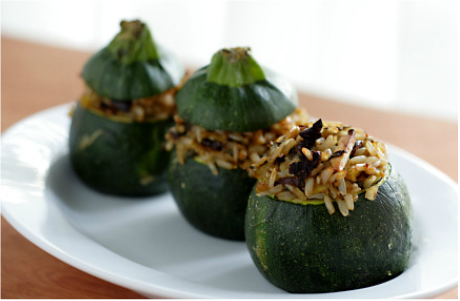 all blended together with cheese and refilled into the squash, then baked until the shell is tender--they are sublime. There! My treatise on summer squashes. If you made it this far, I thank you! Be brave Central Minnesota! And spread the word!